No it's not some kind of science experiment these are the DIY doughnuts you'll find on the Grace the Establishment dessert menu. 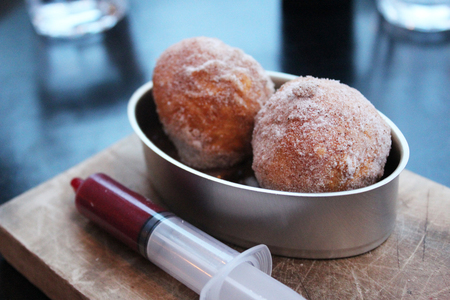 Inside the syringe you've got a tasty berry coulis, and the doughnuts themselves are crunchy on the outside and soft and fluffy on the inside. Stick the syringe in and squeeze the coulis inside. Voila, jam doughnuts. The smaller version that's part of the tasting menu just comes with a small syringe of berry, but if you buy the full dessert you can pick and mix with both berry coulis and an aerated chocolate sauce. Yes it would be possible to serve the doughnuts already filled, but where's the fun in that?